Strange but true: Each tiny apple seed contains a minute dose of the poisonous chemical - cyanide, but you'd have to swallow tons before it started to harm you. Granny Smith Apples are the classic tart, green apple. Our Granny Smith's are always crisp and have the perfect tart flavor. This apple is also an exceptional baking apple, perfect for one of Grandma's apple pies. Let's see, we have the Red Delicious and Gala which are the most popular apple types. Then following behind, there's the Braeburn, Granny Smith, Rome Beauty, Jonagold, Pink Lady, Cameo, Red Delicious.... the list goes on. Incredibly, there are around 7000 varieties - but only about 100 of these are commercially produced. 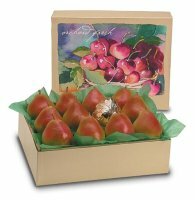 If you're seeking the sweetest, juiciest, most elegant pears, look no further than these royal comice pears. In stature, their yellow skin is brightened by a delicate blush. Just try one, we re convinced that if you do you ll be back again and again. This item ships 2nd day air. Incidentally, the same tree that produces the peach, also produces the nectarine! More grapefruit comes from Florida than the rest of the world combined! As nice as they are, the problem with grapefruits is that they tend to leave a rather bitter taste in the mouth afterwards. This is usually thanks to the white skin sticking like a leech to the edible flesh inside. Oranges have this problem too, but not so nearly as bad the grapefruit does. I've tried out all 4 types of grapefruit now, but they do tend to vary according to how ripe they are, so ranking is tricky. I'll try my best though. White grapefruit Slightly better than the Pink grapefruit, one version I had reduced the bitter flavour to a minimum. The seedless variety of the grape is a must if you want to stay sane. 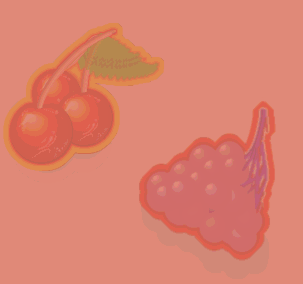 If there had to be a default flavour for a 'tangy' fruit - the grape would be it. 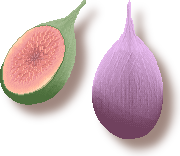 One type of Fig can claim the title of being the sweetest of all fruits. 55% of it is sugar! The dried fig tastes boring, but if you've ever tasted the fresh version, you'll find that it's one of the most subtle fruits going. Very hard to describe the flavour, but try to avoid the type of fig with a redder center, as this 'tangy' element doesn't contrast well and spoils the flavour somewhat.